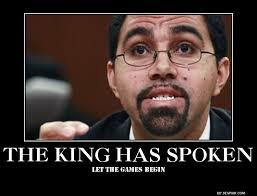 Through the fall and early winter of 2013, New York State Education Commissioner John King held twenty “forums” in various parts of the state to discuss and explain both the mysteries and the miraculous qualities of the Common Core States Standards. With two exceptions, in each and every “forum” King was met with fury and disgust from an outraged citizenry that included both parents and teachers. These encounters with actual people affected by the Common Core were, in fact, so universally negative and hostile that King initially attempted to cancel the entire project — essentially a public relations campaign designed to alternately sweet talk or buffalo the rubes into acquiescence — and skedaddle back to the safety of his cosy office in Albany where untested experiments on other people’s children are far better received. King’s reaction to the anger at the imposition of the Common Core only served to reveal how far removed he is from the policies he imposes. After one such event in Poughkeepsie where the crowd grew raucous after King’s interminable lecture on the Common Core, the commissioner made the astounding statement that the rebellion had been orchestrated by “special interests”, presumably parents. 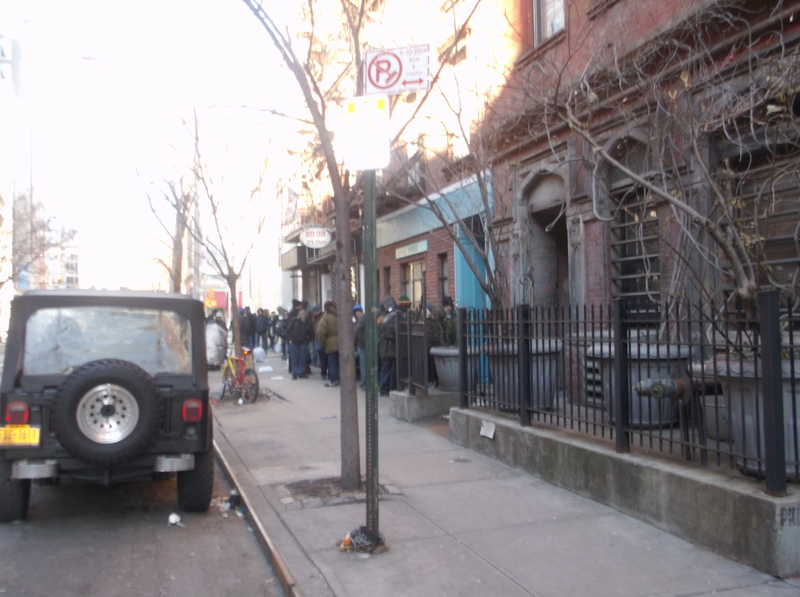 The two exceptions to unmitigated hostility and rejection were the “forums” that were held in Brooklyn and lower Manhattan respectively, the former was allowed to be commandeered by Michelle Rhees’ StudentsFirstNewYork.org, who were let in early and signed up for 44 of the 45 speaking slots; the latter was attended by many of the same paid advocates of SFNY, allied with the Gates-funded Educators 4 Excellence. Both groups did their best to turn the events into creepy cult like love fests for the Common Core and who, for good measure, at times equated the experimental idea with nothing less than a civil right. In short, these two “forums” were a cynical farce bearing no relation whatsoever to the people’s reaction to the Common Core imposition and all that goes with it. So what did King learn from his eighteen encounters with a furious public whom he ostensibly works for and who pays his considerable salary? Judging from his December 30 epistle, after “reflecting and evaluating,” what King has learned is a whole lot of nothing at all. Not from us, in any case if, arguably a great deal from his fans in SFNY and E4E. As has been the practice of its devotees from before the Common Core was even completed, King, employing the pronoun “we”, continues to speak of the untested experiment as if mountains of evidence supported its miraculous powers and the only bump in the road to a “college and career ready” army of youngsters is a faulty implementation, due in part to limited resources. The humble King does concede that the Core (as we like to affectionately call it ) “didn’t invent good teaching, ” only to then boast that the “ CC is the first set of learning standards back-mapped grade by grade from what students need to know and be able to do in college and the workforce,” weaseling past the fact that, as Carol Burris has noted, kids don’t learn backwards, and as others have noted, other than menial jobs, we have no idea what the “workforce” of the future requires or will even look like. But “we” know, somehow, that said workforce needs the Common Core. King goes on and on and on about said need using the usual language about “rigor” and challenge, ” his way to saying, let the public be damned, “we” are doing what we will. One might conclude from King’s letter following his recent experience that John King, a highly educated and intelligent man, is incapable of learning. But to reach that conclusion one would first have to believe that John King was appointed to his position so that, against all evidence, he might serve the people of New York State; that King as commissioner would genuinely listen to and humanely react to the pained complaints of millions of parents and thousands of teachers so harshly affected by the policies he, himself, has championed. Like many others, I have reached a different conclusion: that the powers that put King in the position he now holds have no intention whatsoever of changing anything at all about the Common Core and King will serve them, not us, until he can do so no more. Let the heavens fall but they will get their way. And that is the real meaning of King’s end of the year message. We need to prepare ourselves. This struggle has yet to even begin. 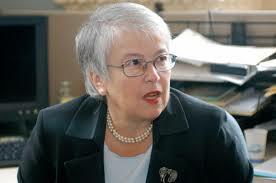 After weeks of hopes and fears and endless internet speculation, it now appears that Mayor Elect Bill De Blasio has selected Carmen Farina, an experienced educator to lead the New York City Department of Education out of the debacle created by twelve years of the reckless experimentation, ceaseless union busting and privatization efforts by Mayor Mike Bloomberg. ( Cathy Black) or a political appointee ( Dennis Walcott) — is, as absurd as it sounds, a major move in the right direction. impossible for someone who has not taught in the NYC public school system in the past decade or so, to grasp how deeply and insidiously Bloomberg ( with help from his fellow “reformers” up to and including Obama ) has degraded the lives of students and cheapened, almost beyond recognition, the noble and ancient vocation of teaching and the very idea of education itself. May amateur hour be finally and mercifully over. Godspeed, Carmen. You’ll need it. And the teachers and the kids and their parents need a real leader who knows of what she speaks and what she does. 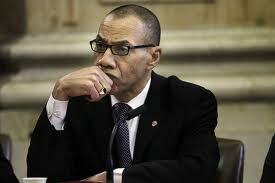 Unless I missed something, contrary to the hagiographic sendoffs to Joel Klein, New York City Department of Education Chancellor Dennis Walcott has passed into history with barely a peep from an often all too adoring media. Of course, given Walcott’s actual accomplishments, this is exactly how it should be but, as so few things in education reform are reported as they are, the absence strikes me as odd if morally apt. In any case, Dennis Walcott seems to have ended his days as the accidental chancellor of the largest school system in America with neither a bang nor a whimper. It could not have come sooner. I don’t know how many of Mayor Bloomberg’s Nicolae Ceaușescu-like Panel of Education Policy (PEPs) I attended while Walcott presided, but I could never see the man (or what was left of him after years of working under Bloomberg) without thinking of Robert Musil’s terrifying existential masterwork, The Man Without Qualities. This was true even if Musil’s work took place in the last days of the Austro-Hungarian Monarchy and Walcott’s reign occurred in what may well prove to be the beginning of an outright American plutocracy (and as a result of that plutocracy.) There he would sit in silence in the center of the stage, squint-eyed as if in contemplation, long slender fingers against each other as if in prayer, displaying one of his two true talents: appearing to be thoughtful and concerned without actually being so. There he would sit in silence as speaker after speaker, teacher after teacher, parent after parent, student after student would argue, beg, scream and sometimes weep that their school not be “co-located” or shut down altogether which they always were. There he would sit in silence, surrounded by other handpicked shills, *surrounded in turn by the NYPD, haughty to the public, obsequious to Bloomberg, the perfect corporate Yes Man, the Ultimate Shill, the Man Without Qualities. When Walcott did speak, at events or for the TV cameras, it was always with the same calm, subtly condescending tone, always employing the same exhausted-at birth-slogans (“college and career ready,” “ competing in the global economy, ” “data driven,” “accountability “) disguised as policies over and over and over again as if he were an automaton. Which in a sense he was. Incredibly, as with all of three of Bloomberg’s chancellors, Walcott was not an educator but a career political appointee — a mandarin — who knew when to speak, when to be silent, and how to take orders. Above all, he knew how to please the king. At this he excelled. From a teacher’s perspective there was something grotesque about taking orders from a person whose pedagogical qualifications would not allow them to enter a classroom without the presence of a certified teacher but, of course, part of the whole corporate reform project is to destroy the self worth of teachers at the same time you praise them. As with his two predecessors, Walcott’s lack of qualifications did not in the least stop him from pontificating about education as if he knew exactly what he was talking about. In this way did Walcott play his part in the wholesale de-professionalization of education in America, “ from the Grand Coulee Dam to the capital” as a poet once sang. Walcott, of course, was an accidental chancellor, thrust into the role following Bloomberg’s insane decision to replace former prosecutor Joel Klein with magazine publisher Cathy Black. It took poor Cathy but ninety days — ninety days of slow motion self destruction and public spectacle — until Bloomberg unceremoniously threw her under the bus and about ten seconds after that for Cathy Black to become” Cathy Who? 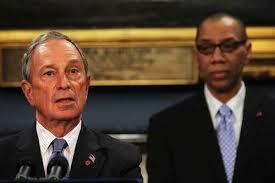 ” in the vicinity of Mike Bloomberg and City Hall. It’s safe to say that Bloomberg was the only man on earth, perhaps the only man in human history, who thought people like Black and Walcott were somehow qualified to run(or pretend to run) the largest and most diverse school system in America. Black was an absurd figure in a way that Walcott was simultaneously too empty and too calculating to ever be. But, for all her failings, Black was not a shill in the way that Walcott was. Black was her own person and one who seemed to (fatally) believe that she was going actually to be chancellor somehow, rather than to play dummy in Mike Bloomberg’s ventriloquist act. That belief, as much or more than her spectacular incompetence and foolish comments about birth control and the like — is precisely what got her into trouble and brought on Walcott. In his twelve year reign, no act was more emblematic of the delusional world of Mike Bloomberg than his appointment of Cathy Black and no act more desperate than his replacement of Black with Walcott. In a way, Walcott’s ascension, though reckless and irresponsible, was easy. At least for Walcott. What happened ? Walcott went from the concerned looking guy in the back of the photo opportunity with Bloomberg to the concerned looking guy in the front of the photo opportunity with Bloomberg. And yet his position, he knew, remained exactly the same. 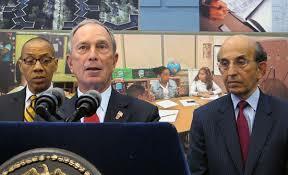 Walcott’s years standing behind Bloomberg looking concerned taught him something that a Cathy Black never learned: Walcott knew that his job was to discern Bloomberg’s will and make sure it was done. His job, that is, was to be a human appendage. And so he was. And one that was particularly skilled at Walcott’s other true talent: concealing his subtle viciousness. This viciousness was ever present in Walcott’s very attitude towards teachers — U rating appeals reached a level of almost 100 % rejection under Walcott, a scandal worthy of Federal investigation — but perhaps found its purest expression in the DOE’s relentless persecution of Francesco Portelos, a teacher who had the temerity to stand up to a corrupt administration and has been paying for ever since. Meanwhile the city has grown so politically and morally degenerate under Bloomberg that Walcott’s open, undisguised and clearly illegal politicking for Bloomberg on the public dime in a public school to public employees was not only not scandalous, but happily reported by the NY Times, which, too, seems to have degenerated in somewhat similar lines during the Bloomberg era. Extremely skilled at appearing to be thoughtful. Years of tip-toeing around Bloomberg left Walcott no doubt as to the proper decorum to use in pleasing the tycoon knowing that the pleased tycoon would ensure his personal comfort till the ends of his days. For a handful of Americans, and Dennis Walcott is one of them, one of the wonderful benefits of living in a nation that allows individuals like Bloomberg to accumulate the wealth of nations is that those who serve such kings are well compensated for their service. Rest assured Walcott will be. I will not miss him for there is nothing there to miss. And I am not alone. Meanwhile, four days before he is sworn in, Mayor Elect Bill DeBalsio has yet to announce a new chancellor. This has unsettled many a NYC teacher and for excellent reason. Unquestionably, the pressure on DeBlasio from the hydra headed billionaire backed corporate reform groups and personages (like Bloomberg) are relentless. Equally unquestionable is the wholesale demoralization and worse of the NYC teachers profession and the school system as a whole if DeBlasio dose not stand up to them and do the right thing. I do not even wish to imagine what is bound to happen is he does not. *With the exception of the noble and brass-balled Patrick Sullivan. 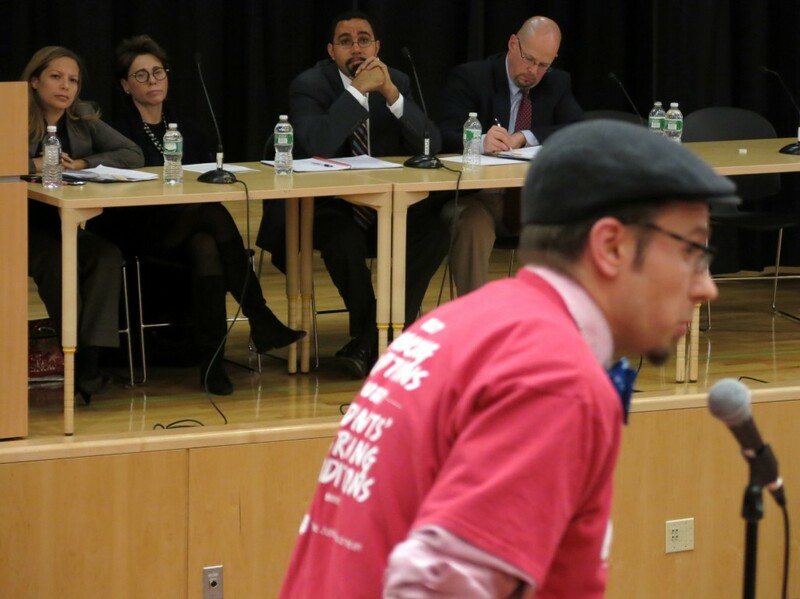 Parent activist Noah Gotbaum spoke passionately and personally about an entire array of DOE policy failings, including the fact that the Common Core barely even acknowledges the existence of, never mind the realties of, special needs children. Addendum: Herein an uncommonly frank account in the main stream media of what transpired at King’s and Tisch’s New York “forums” and why.